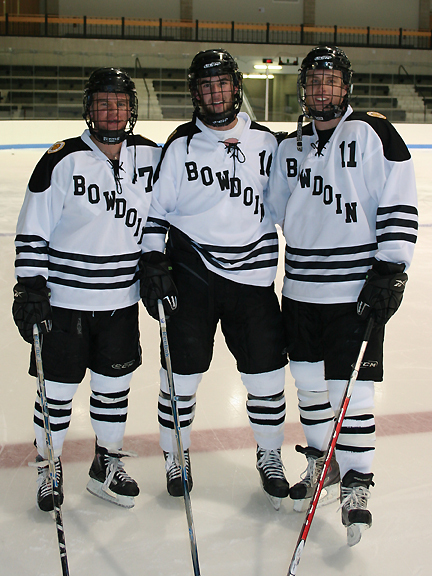 The Bowdoin College men’s ice hockey team will don “throwback” uniforms in honor of Alumni Weekend at Sidney J. Watson Arena this Friday and Saturday, January 28-29. The Polar Bears (11-3-0), ranked fifth in the latest Division III poll, will host ninth-ranked Williams at 7 p.m. Friday and defending NESCAC champion Middlebury at 4 p.m. Saturday. Live coverage will be available for both games via video webcast and live statistics. All regular-season games at Watson Arena are free of charge and no tickets are required. Doors open one hour prior to game time each day. Those are absolutely gorgeous unis. Switch back to these forever. As a #11 from 1962-64, glad to see its prominent spot in the photo.